In the mid 1800s, as a single collar factory in Troy blossomed into dozens, Albany became famous for manufacturing a product of its own -- pianos. In an age when people made their own music, the growing middle class felt no home was complete without a piano. So when J. & H. Meacham began manufacturing pianos around 1829, it set off a boom that could have given Albany fair claim to the nickname of "Piano City." John and Horace Meacham started it all around 1829. Their company sold a number of instruments -- including drums and woodwinds -- at their store at 84 State Street (the space now occupied by the IBM tower). 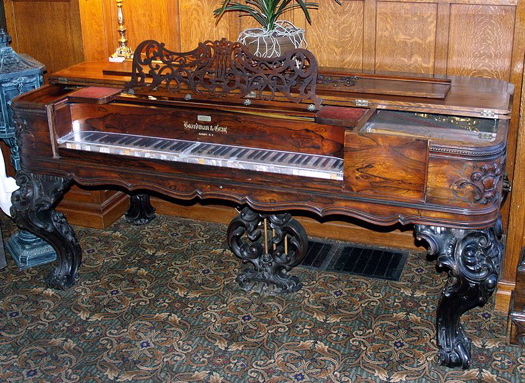 Pianos had just achieved the modern form with their full iron frame, and Horace Meacham saw a growing demand for them. Meacham convinced John Osborn, a student of the new frame's inventor, to come to Albany from Boston, and build the instruments under the J.&H. Meacham name. I.P. Cole, a rival State Street instrument dealer and vocal teacher, would not be outdone by Meacham, so he hired Burns, Ballentine & Co. to build pianos for his shop in 1835. With the Panic of 1836, Cole's business went to one of his backers, a wholesale grocer named William G. Boardman. Apparently the piano business was more interesting or more demanding than groceries. Boardman fully immersed himself in the piano business and called on James A. Gray to partner with him. In New York City, Gray had apprenticed in piano building and distinguished himself with a number of patents for improvements to the piano, both practical and fanciful, including the "Dolce Campana" attachment, one of a number of devices designed to make a piano sound like something else -- a desire that continues in the electronic keyboard age. 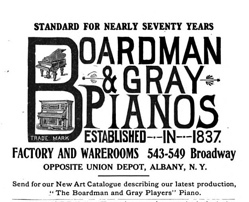 The firm became Boardman & Gray in 1837, and quickly developed a national reputation as a source of affordable, decorative pianos. In 1857, Graham's Illustrated Magazine gushed, "While on this subject, we may say--pianissimo--that Boardman, Gray & Co.'s Albany pianos have, under [piano virtuoso Sigismond] Thalberg's hands, shown themselves to be instruments of wonderful power and sweetness, rivaling the far-famed chef d'oeuvre of Erard,"Â the creator of the modern piano. There were numerous other prominent piano-makers beside Meacham and Boardman & Gray: Grovesteen, Frickinger, Francis and Edward Burns, Henry Hazelton, William McCammon, and the firm of Marshall, James and Traver (later Marshall & Wendell) all made names for themselves as notable piano makers in Albany, nearly all of them locating somewhere along Broadway. Boardman & Gray rebuilt at the same location (the "new" factory still stands, in part, on the corner of Broadway and North Ferry), but later moved to 239 North Pearl Street near Livingston. William Boardman left the firm in 1866, and James Gray, eventually made his son William a partner. In 1885, this factory also burned, taking several nearby buildings with it and killing three firemen. James Gray died just a few years later, in 1889, but William carried on and the company survived for decades more, moving the factory and showrooms to 543-549 Broadway, across from Union Station. Piano making peaked in 1905, when 400,000 were made in the U.S. In the coming decades, radio and the phonograph changed music from something played in every family's parlor into a mostly passive form of entertainment. 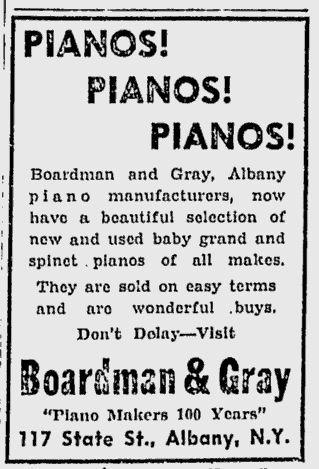 But Boardman & Gray, "Piano Makers 100 Years," were still building instruments at Jay and Eagle Streets and selling them just a couple of blocks away at 117 State St. as late as 1950. They were also selling electric organs, radios, and television sets. In 1957, their retail store had been taken over by Cluett & Sons, old-time piano dealers but not manufacturers, though Boardman's factory on Jay Street remained. Exactly when they went out of business isn't clear, but with them went the memory that Albany was once a hotbed of piano-making. Old pianos are like luggage and herpes; you can't get rid of 'em. Marshall & Wendell outlasted them all, though not in Albany. The American Piano Co. of Rochester bought the trademark and moved manufacturing to Rochester, though instruments continued to be marked Albany. We have a ca. 1869 J.A. Gray square grand piano. Boardman & Gray apparently sold part of the business to William McCammon in the early 1862; In 1867 they terminated the contract with McCammon, which seemed to result in a dispute over the ownership of the name "Boardman & Gray." This seems to explain why our piano is a "James A. Gray" and not a "Boardman & Gray". While McCammon is claiming his legitimacy as the successor to "Boardman & Gray" in an 1878 article in the the Music Trade Review (April 18). I have a Meacham & Sons square piano, and it actually works quite well. Let me know if there is interest and I can send a picture. My brother-in-law has a Boardman & Gray of undetermined age. It was tuned at least twice with the tuner marking the inside of the case with the date of tuning. Once in 1916 and last in 1922. Can I assume the piano was manufactured just before the 1916 tuning? This pano plays very well, my niece is learning to play on it. Can you believe it, a modern-day piano tuner is refusing to attempt to tune it. My Brother-in-law is looking for a different piano tuner. I have a Boardman&Gray #75357. Wonder when it was made? There are a number of vintage piano forums that may be able to help, so I'd try those boards for assistance in dating your piano. Unlike some other brands, I haven't run across a definitive listing of serial numbers and dates for Boardman & Grays. Boardman & Gray made a piano with a dolce campana pedal. John Underner, an Albany musician, demonstrated it around 1850. I'm looking for descendants of John, Lewis or any of the Underner family for research in 19th century handbells. If anyone knows of Underners still living in the Albany area, please post. Looking for a George Gomph piano/piano forte made in Albany. Any help would be appreciated. My sister has a gorgeous Gomph square grand. It was our grandmother's high school graduation gift from her father, believe it was second-hand. Our historic home in Farmington, MO has a Boardman and Gray square grand piano in our meeting room and would love to know how to trace its history. Whether it could be tuned or not. I just bought, sight unseen, a Meachum & Co (1835) American Rosewood square piano and stool. Some keys stick and some won't strike to produce sound. Any value to this instrument?